Asara Wine Estate and Luxury Hotel is situated in the rolling Polkadraai Hills on the Eastern side of the Stellenbosch Wine Appellation. The hills offer different ‘above sea level’ soils, different aspects and different planting directions. Some have more sun direct on the grapes at dawn, and in the evening, some are well protected by excellent canopy management. 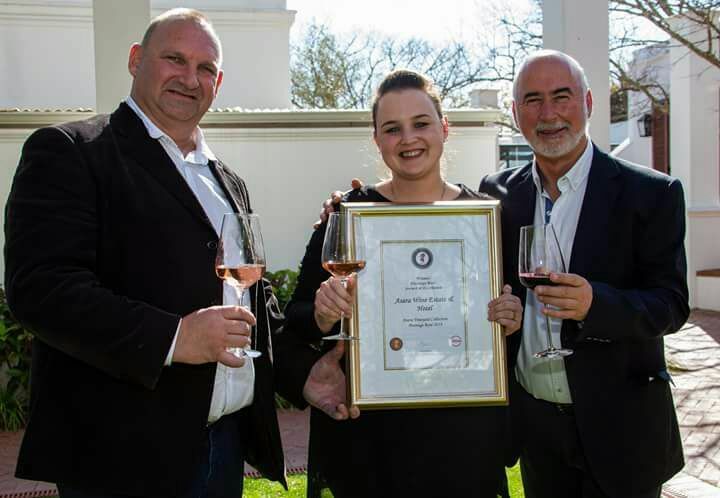 The Asara Vineyard Collection Pinotage Rosé 2018 has been in the news latterly as it received an Award of Excellence in The Absa Pinotage Rosé awards for this year. Only three wines made this cut. This is a huge affirmation that what the cellar team is doing in the cellar and the management of the vineyards is on point. The grapes for The Asara Vineyard Collection Pinotage Rosé 2018 come from a single vineyard planted on ancient Vilafonté soils. The vines grow at an altitude of 100m in east-facing rows, attracting sun exposure on the bunches in the morning. The result is an even handed 9 tons per hectare. Harvested at two different windows in the ideal ripeness window. The first, early harvested, ensures the delicious crisp acidity in the final wine, the second, harvested later gives forth the lively red fruit. One must remember that the parent grape Pinot Noir tends more to red berry flavours. Fermentation takes place at low temperatures to retain the aromas and flavours. Immediately after fermentation the wine is blend and prepared for bottling. Bottled in a clear glass Bordeaux shaped bottle with a screw cap. In the glass, a gem bright rose diamond in colour. Fraises des bois, roadside brambles and orange blossom water. Crisp and fresh from entry through to the long and gently refreshing aftertaste. The wild strawberries again, chunky watermelon and pink skinned grapefruit oil. Utterly delicious for any time of the day quaffing. Place potatoes in a pan of cold water, bring to the boil, then cook for 15-20 minutes until tender. Drain, return to pan over low heat and toss for 1 minute to remove moisture. Cool slightly, then peel and pass through a potato ricer into a large bowl. Add nutmeg, eggs and 1 tablespoon salt, then sift in flour. Using hands, gently mix to a soft dough, adding a little extra flour if too sticky – don’t overwork or gnocchi will be tough. Turn onto a floured bench and dust hands with flour. Take a cupful of dough, form into a log, then use a rolling pin to gently roll into a 2cm-thick rectangle. Use a sharp knife to cut into 2cm-wide strips, then cut strips into 2cm lengths. Place gnocchi on a flour-dusted tray in a single layer, then repeat with remaining dough. At this stage, you can set gnocchi aside, covered with a tea towel, for 2-3 hours until ready to cook. When ready cook the gnocchi in a large pan of boiling salted water. As soon as they rise to the surface (30-60 seconds), remove to a tray with a slotted spoon. Heat the oven to 140°C.Line a baking sheets with non-stick baking paper or lightly brush each sheet with a little olive oil. Cut each tomato in half lengthways and place – cut side up – on the prepared over trays. Lightly drizzle the tomatoes halves with olive oil, then sprinkle evenly with parsley, a scant sprinkle of sugar and some salt and freshly ground black pepper. Roast for 2-21⁄2 hours, or until the tomatoes are lightly dried and darkened. Remove from the oven when done and set aside to cool. These can be made a day in advance. Mix garlic, tarragon leaves, olive oil, lemon juice & zest together in a small jug. Preheat oven to 180C. Arrange Prawns on a roasting tray. Pour over the olive oil, garlic & tarragon. Season lightly with salt & pepper. Roast for 20 minutes or until cooked through. Reserve Pan Juices. Place 3 – 4 tiger prawns on each plate with 8-9 pieces of freshly cooked gnocchi. 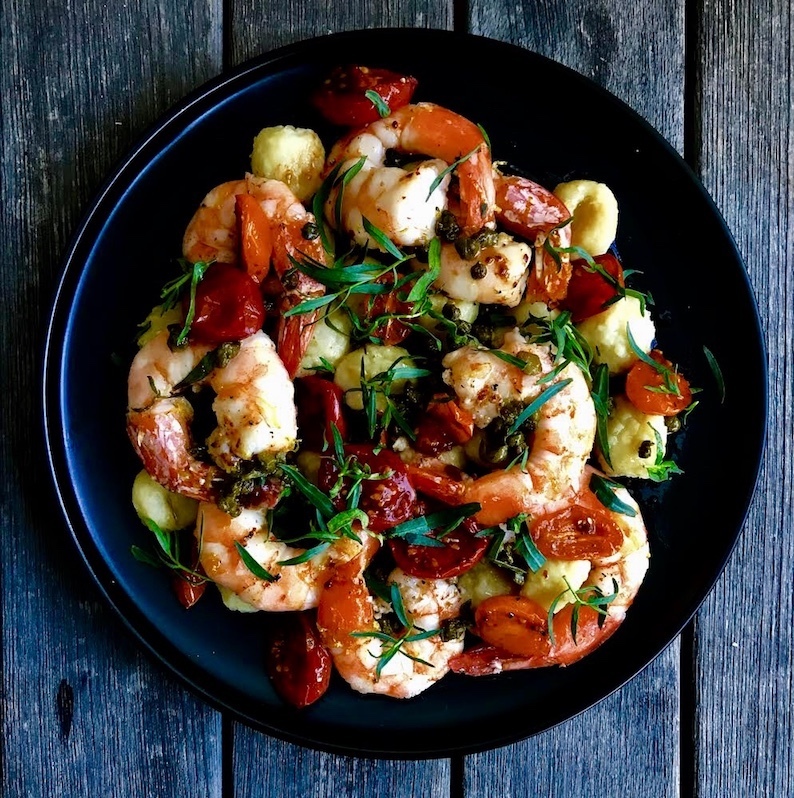 Add a few slow roast tomatoes, garnish with fresh tarragon leaves and drizzle with the garlicky, lemony prawn pan juices.